1. Valuable things ( ie: cell phone or camera ) by the pool or at the beach. 2. Locks cell phone to an outlet while it is charging. 3. Locks power tools plugged into an outlet. 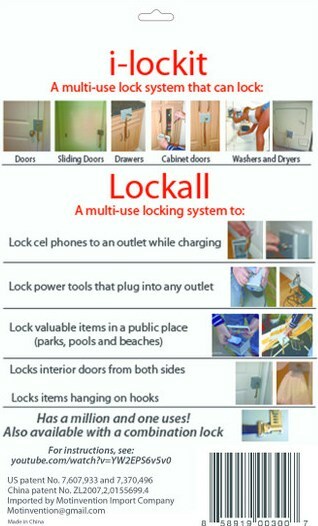 Lockall also secure doors and valuable items, in a fast and easy way. There is no preparation needed, and no damage to the surface. There is a wide market for this product to secure doors and valuable items, in a fast and easy way. There is no preparation needed, and no damage to the surface. Just hang the hook on the internal surface, Close the door, tie the plate to the door, and lock it. Parents can lock bar cabinet to prevent access to teenagers. Roommates and student in dorms can lock their closet sliding door, and bedroom doors. Construction workers can lock their electrical tools to an outlet to prevent theft. Security Companies can lock equipment plugs to an outlet to prevent disconnection. Hospital workers can lock instruments plugs to an outlet to prevent disconnection. Office workers can lock drawers, cabinets, and instruments plugs to an outlet. 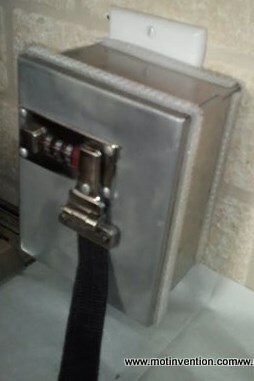 Travelers can secure hotel safe to prevent from manager to unlock it. Travelers also can lock a cell phone by the pool. or lock it to an outlet while it is on charge. Laundromat users can lock W & D freeing from watching W & D.
home owner can lock side gate with Lock-all. to secure doors and valuable items, in a fast and easy way. to secure cell phone and valuable items, by the pool or beach. to lock cell phone to an outlet while it is on charge. to lock W & D in Laundromat. lockall.net looking for distrebuter for this prodact. also looking for manufacture to licence it.